Daler Rowney Gouache Introduction Set 12 x 15ml tubes of artist quality paint. 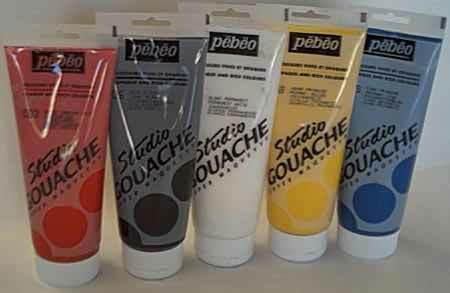 Pebeo Studio Gouache 220ml - Primary Yellow. Pebeo gouache 220ml - Carmine. Pebeo Gouache 220ml - Primary Magenta. Pebeo Studio Gouache 220ml - Tyrian Pink. Pebeo studio gouache 220ml - Cobalt Violet.